Item # 120350 THE ATHENIAN MERCURY by John Dunton, London, England, 1695. This was a fine gentleman's newspaper which was very popular in the coffeehouses of early England. Interesting reading on a wide range of topics & one of the earliest periodicals in English. Partially in question/answer format. This newspaper was published before any American newspapers even existed. 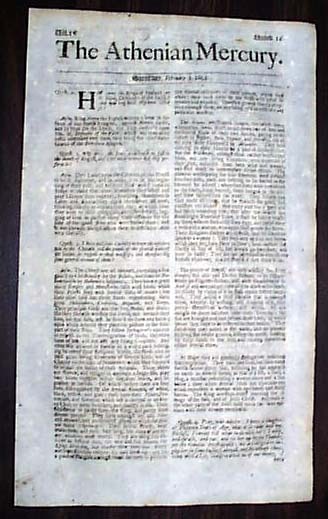 A single sheet newspaper printed on both sides (typical for the period), measuring 7 1/2 by 12 1/2 inches. Very nice, clean condition printed on high-quality, cloth-based newsprint.